The Pittsburgh Panthers (13-2 3-0) rolled into Cincinnati (10-4 2-1) high off a win over Syracuse, and they continued to climb after beating the Bearcats Monday night 74-71. Ashton Gibbs and Gilbert Brown powered Pitt with 19 and 17 respectively. Gilbert Brown had the most emphatic basket with a baseline drive and dunk on Steve Toyloy pictured above. Yancy Gates had a monster 17 point 14 rebound game for the Cats, but it was not enough. Deonta Vaughn had his third straight 17 point game. Most of those points came late after Pitt free throw attempts to cut the score. Lance Stephenson had 15, but did nearly all of his damage in the first half. Jermaine Dixon of Pitt had 10 and 6, and was the final scorer in double digits. 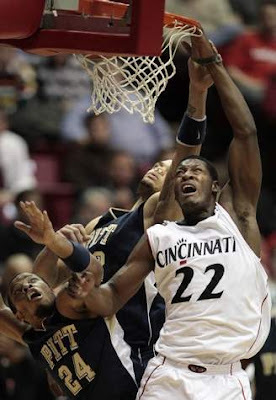 Things started off hot for the Bearcats, especially Yancy Gates and Lance Stephenson. The duo powered a quick 11-4 lead. The Panthers would respond with a 9-0 run to take the lead, and stifle the UC offense. The Panthers ratcheted up the pressure every time UC would need a basket, and it started early. Nasir Robinson had all 7 of his points during the Panthers surge. The Panthers would take a lead, and the Bearcats would fight back to tie. Ashton Gibbs had 14 in the half for Pitt. The Bearcats were lead by Stephenson's 13, and Gates' 12-9 and 3 blocks on 12-17 shooting, everyone else had 7 points on 3-15 shooting. Pittsburgh held the Cats to 2 points the last 3:10 and lead 38-32 at the half. The second half started with a rare sight ever seen. Steve Toyloy made 2 free throws. That's right, 49% foul 'shooter' nailed 2 in a row. I was stunned. The Panthers were called for 4 quick fouls as the officials locked down on the physical play this half. The play wasn't out of control, but the officials had the whistles ready. The Bearcats went on a 8-2 run pounding the ball inside to tie the score. Gibbs and Brown got the Panthers right back in the lead, shredding the UC interior defense by driving to the lane. The guards couldn't contain Gibbs, Brown, Dixon or Wanamaker. Deonta Vaughn nailed a 3 to cut the Pitt lead to 46-45, but UC threw away the next possession and Travon Woodall had a break away lay up. The score stayed tight, and UC briefly took the lead on a Darnell Wilks lead 52-51. Brown would answer with a 3, and then the most entertaining part of the game broke out. After a miss, Rashad Bishop did this. After the ferocious dunk back, Gilbert Brown would have the spectacular play highlighted above. A fantastic 30 seconds of action. The score would stay tied until the Panthers got Dante Taylor a wide open dunk and took a 60-58 lead they would never relinquish. The Bearcats have a problem with their guards not looking inside, and it hurt as Yancy Gates would get position, and not the ball. The Panthers forced tough jump shots the Bearcats were too happy to take. Stephenson and Gates were 2-10 for the half at this point as a result. Gates looked warn out the second half. While the Cats were forced into tough shots, the Panthers were able to get lay ups by Brown, and another dunk opportunity by Taylor, who had 7. The most frustrating point of the game, and where it was lost, happened when Pitt had a 66-64 lead after Dion Dixon made 2 free throws. Pitt would miss a shot, but UC couldn't grab the rebound, and Pitt got a tie up and possession. They wouldn't make the shot, but they ran clock. With 2:15 left, Deonta Vaughn couldn't hold the ball after a spin move, and UC wasted a possession. Pitt would miss, and Rashad Bishop would jack up a fast 3 with 1:30 left. Brad Wanamaker would be forced to travel, but UC couldn't score as Lance Stephenson was forced into a tough jumper. Gates and Stephenson were 3-12 this half for 6 points. Jermaine Dixon made 2 freebies to make the score 68-64. Wanamaker would make another free throw after Vaughn missed a double clutch runner. Down 6, Vaughn made a lay up and was fouled. Gibbs would hit 2 free throws, followed by another Vaughn lay up. Ashton Gibbs would have his free throw made streak end at 46, which lead to the last ditch UC chance. The Bearcats issues on offense really hurt here. They couldn't offensive rebound, and the half court is terrible at times. The Cats really need a point guard to make things work. The Cats kept the Panthers off the offensive glass as well, both had 6. The Cats shot 49%, but 3-12 from 3. This team shoots too many 3s for a terrible 3 point shooting team. The Panthers also shot 49%, were only 4-7 from 3, but were 20-27 at the free throw line. UC would only shoot 8-11. The Panthers have a nice set of guards with Gibbs, Wanamaker, Dixon and Brown. Brown was suspended until the last 4 games, and Pitt has won all 4 and been impressive the last 2 offensively. This was a tough one for UC. They could never quite get over the hump, unlike against Rutgers. Games like this are going to happen, and we can't let it get us down. Mainly because we play on Wednesday.